Eleven years ago, with his dad John Jerome as his Tiger Cub den leader, John London "Jake" Jerome III started his trail to Eagle as a Tiger Cub Scout in Pack 800. Today, Jake noted that it's "more about the journey than the destination" when receiving his Eagle Scout rank in a ceremony at Holy Trinity Episcopal Church, where he and his family are parishioners. Jake with his family: sister Maggie, father John and mother Donna. After the presentation of colors, Assistant Scoutmaster Jake Camp led the opening ceremony and Holy Trinity Assistant Rector Father Thomas Joyner offered an invocation. Longtime family friend Greg Glasscock outlined Jake's Scouting and personal journey by recalling many of Jake's activities and accomplishments -- often recalling his high level of commitment to staying involved and doing his best. His sister, Maggie, read a poem, "On Eagle's Wings," by Eve Englebright. while his father John looks on. 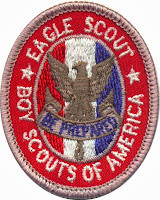 Scoutmaster Baird administered the Eagle Promise to Jake, accompanied by other Eagle Scouts in attendance. Jake's parents, Donna and John, presented Jake with his Eagle Scout medal and neckerchief slide, respectively. Jake in turn presented his parents with Eagle Scout Mom and Dad pins. 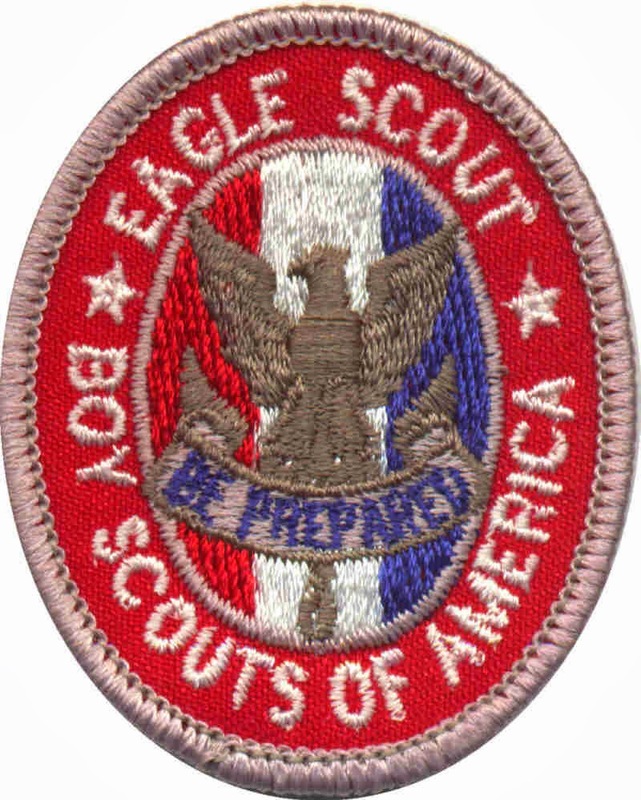 Jake shared memories of his Scouting "Trail to Eagle." Jake then addressed the crowd of more than 50 family, friends and other Scouts by recollecting many of his Scouting experiences, a trip to Northern Tier, and the many opportunities he had to serve in leadership positions -- including in his previous troop and as Troop 50's first senior patrol leader. He joked about not understanding why he was honored by being elected the troop's first SPL, but despite that he felt he hadn't broken the troop and challenged Andrew, the troop's current SPL, to avoid doing the same. Finally, Jake presented Eagle Scout Mentor pins to Rudy Martin, who had provided significant resources and support for his Eagle Scout project; as well as Greg Glasscock and Scoutmaster Baird. He also presented one to his dad, noted that his dad's "investment" far exceeded the money spent on trips and campouts, but included the life lessons he learned along the way. that trail as his scoutmaster. Jake's grandfather, the "original" John London Jerome, adjourned the ceremony with a closing prayer. Guests stayed for a reception following the ceremony. View the troop's online photo album for photos from Jake's Eagle Scout ceremony.